“Vax” redirects here. For other uses, see Vax (disambiguation). A 32-bit system with a CISC architecture based on DEC’s earlier PDP-11, VAX (“virtual address extension“) was designed to extend or replace DEC’s various PDP ISAs. The VAX architecture’s primary features were virtual addressing (for example demand paged virtual memory) and its orthogonal instruction set. 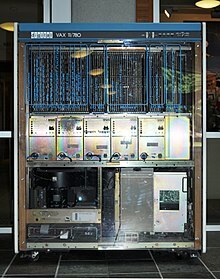 The name “VAX” originated as an acronym for virtual address extension, both because the VAX was seen as a 32-bit extension of the older 16-bit PDP-11 and because it was (after Prime Computer) an early adopter of virtual memory to manage this larger address space. Early versions of the VAX processor implemented a “compatibility mode” that emulated many of the PDP-11’s instructions, and were in fact called VAX-11 to highlight this compatibility and that VAX-11 was an outgrowth of the PDP-11 family. Later versions offloaded the compatibility mode and some of the less used CISC instructions to emulation in the operating system software. The VAX instruction set was designed to be powerful and orthogonal. When it was introduced, many programs were written in assembly language, so having a “programmer-friendly” instruction set was important. In time, as more programs were written in higher-level language, the instruction set became less visible, and the only ones much concerned about it were compiler writers. The “native” VAX operating system is Digital’s VAX/VMS (renamed to OpenVMS in 1991 or early 1992 when it was ported to Alpha, modified to comply with POSIX standards, and “branded” as compliant with XPG4 by the X/Open consortium). The VAX architecture and OpenVMS operating system were “engineered concurrently” to take maximum advantage of each other, as was the initial implementation of the VAXcluster facility. Other VAX operating systems have included various releases of BSD UNIX up to 4.3BSD, Ultrix-32, VAXELN, and Xinu. More recently, NetBSD and OpenBSD have supported various VAX models and some work has been done on porting Linux to the VAX architecture. OpenBSD discontinued support for the architecture in September 2016. The first VAX model sold was the VAX-11/780, which was introduced on October 25, 1977 at the Digital Equipment Corporation’s Annual Meeting of Shareholders. Bill Strecker, C. Gordon Bell‘s doctoral student at Carnegie Mellon University, was responsible for the architecture. Many different models with different prices, performance levels, and capacities were subsequently created. VAX superminicomputers were very popular in the early 1980s. For a while the VAX-11/780 was used as a standard in CPU benchmarks. It was initially described as a one-MIPS machine, because its performance was equivalent to an IBM System/360 that ran at one MIPS, and the System/360 implementations had previously been de facto performance standards. The actual number of instructions executed in 1 second was about 500,000, which led to complaints of marketing exaggeration. The result was the definition of a “VAX MIPS,” the speed of a VAX-11/780; a computer performing at 27 VAX MIPS would run the same program roughly 27 times faster than the VAX-11/780. Within the Digital community the term VUP (VAX Unit of Performance) was the more common term, because MIPS do not compare well across different architectures. The related term cluster VUPs was informally used to describe the aggregate performance of a VAXcluster. (The performance of the VAX-11/780 still serves as the baseline metric in the BRL-CAD Benchmark, a performance analysis suite included in the BRL-CAD solid modeling software distribution.) The VAX-11/780 included a subordinate stand-alone LSI-11 computer that performed microcode load, booting, and diagnostic functions for the parent computer. This was dropped from subsequent VAX models. Enterprising VAX-11/780 users could therefore run three different Digital Equipment Corporation operating systems: VMS on the VAX processor, and either RSX-11M or RT-11 on the LSI-11. The MicroVAX I represented a major transition within the VAX family. At the time of its design, it was not yet possible to implement the full VAX architecture as a single VLSI chip (or even a few VLSI chips as was later done with the V-11 CPU of the VAX 8200/8300). Instead, the MicroVAX I was the first VAX implementation to move some of the more complex VAX instructions (such as the packed decimal and related opcodes) into emulation software. This partitioning substantially reduced the amount of microcode required and was referred to as the “MicroVAX” architecture. In the MicroVAX I, the ALU and registers were implemented as a single gate-array chip while the rest of the machine control was conventional logic. A full VLSI (microprocessor) implementation of the MicroVAX architecture arrived with the MicroVAX II’s 78032 (or DC333) CPU and 78132 (DC335) FPU. The 78032 was the first microprocessor with an on-board memory management unit The MicroVAX II was based on a single, quad-sized processor board which carried the processor chips and ran the MicroVMS or Ultrix-32 operating systems. The machine featured 1 MB of on-board memory and a Q22-bus interface with DMA transfers. The MicroVAX II was succeeded by many further MicroVAX models with much improved performance and memory. Further VLSI VAX processors followed in the form of the V-11, CVAX, CVAX SOC (“System On Chip”, a single-chip CVAX), Rigel, Mariah and NVAX implementations. The VAX microprocessors extended the architecture to inexpensive workstations and later also supplanted the high-end VAX models. This wide range of platforms (mainframe to workstation) using one architecture was unique in the computer industry at that time. Sundry graphics were etched onto the CVAX microprocessor die. The phrase CVAX… when you care enough to steal the very best was etched in broken Russian as a play on a Hallmark Cards slogan, intended as a message to Soviet engineers who were known to be both purloining DEC computers for military applications and reverse engineering their chip design. In DEC’s product offerings, the VAX architecture was eventually superseded by RISC technology. In 1989 DEC introduced a range of workstations and servers that ran Ultrix, the DECstation and DECsystem respectively, based on processors that implemented the MIPS architecture. In 1992 DEC introduced their own RISC instruction set architecture, the Alpha AXP (later renamed Alpha), and their own Alpha-based microprocessor, the DECchip 21064, a high performance 64-bit design capable of running OpenVMS. The VAX supports many addressing modes: literal, register, postincrement, predecrement, register deferred, postincrement deferred, predecrement deferred, displacement (byte, word, long), displacement (byte, word, long) deferred; also indexed, which may be combined with many of these. An “immediate” mode is synonymous with program counter (PC) postincrement, and many addressing modes could use the program counter (which is also R15) instead of other registers. This provided for easy generation of position-independent code through “PC-relative” addressing. The VAX also has some “load effective address” instructions, which do not access memory but compute the address that should be used. Cancelled systems include the “BVAX“, a high-end ECL-based VAX, and two other ECL-based VAX models: “Argonaut” and “Raven“. A VAX known as “Gemini” was also cancelled, which was a fall-back in case the LSI-based Scorpio failed. It never shipped. Jump up ^ Payne, Mary; Bhandarkar, Dileep (1980). “VAX floating point: a solid foundation for numerical computation”. SIGARCH Comput. Archit. News. ACM. 8 (4): pp 22–33. doi:10.1145/641845.641849. ISSN 0163-5964. ^ Jump up to: a b Levy, Henry; Eckhouse, Richard (2014-06-28). Computer Programming and Architecture: The Vax. Digital Press. ISBN 9781483299372. Jump up ^ “VAX MACRO and Instruction Set Reference Manual”. http://www.itec.suny.edu. Retrieved 2016-06-19. Jump up ^ Clinton F. Goss (August 2013) [First published June 1986]. “Machine Code Optimization — Improving Executable Object Code” (PDF) (Ph.D. dissertation). Computer Science Department Technical Report #246. Courant Institute, New York University. arXiv:1308.4815  . Bibcode:2013arXiv1308.4815G. Retrieved 22 Aug 2013. Lay summary. ^ Jump up to: a b Rainville, Jim; Howard, Karen, eds. (1997). “VAX/VMS at 20”. Digital Equipment Corporation. Retrieved 2018-07-20. Jump up ^ “Porting Linux to the VAX”. Jump up ^ “OpenBSD 6.0”. 2016. Retrieved 2017-06-20. Jump up ^ “VAX 11/780, The First VAX System (October 1977)”. Jump up ^ Slater, Robert (1987). Portraits in Silicon. MIT Press. p. 213. ISBN 978-0-262-69131-4. Jump up ^ “VAX 11/780 Computer – CPU”. Computer History Museum. Retrieved 2012-10-24. Jump up ^ “VAX Systems: A letter from Jesse Lipcon”. Archived from the original on 2000-08-15. Jump up ^ “If It Ain’t Broke, Don’t Fix It: Ancient Computers in Use Today”. PCWorld. Retrieved 2016-06-19. Jump up ^ “VAX MACRO and Instruction Set Reference Manual”. OpenVMS documentation. April 2001. Jump up ^ VAX Architecture & Assembly Reference (PDF). Department of Computer Science, Rochester Institute of Technology. Retrieved 2012-09-14. Jump up ^ Mark Smotherman (2008-07-19). “Who are the Computer Architects?”. Retrieved 2008-09-30. Jump up ^ “RAL Informatics Report 1984-85”. Retrieved 2007-10-15. Jump up ^ “The TPA story”. Retrieved 2007-10-15. Jump up ^ Dujnic, J.; Fristacky, N.; Molnar, L.; Plander, I.; Rovan, B. (1999). “On the history of computer science, computer engineering, and computer technology development in Slovakia”. IEEE Annals of the History of Computing. 21 (3): 38–48. doi:10.1109/85.778981. Jump up ^ Laimutis Telksnys; Antanas Zilinskas (July 1999). “Computers in Lithuania” (PDF). IEEE Annals of the History of Computing. 21 (3): 31–37. doi:10.1109/85.778980.